I’m a neat freak and I don’t like clutter very much. I clean, pick up mess and unconsciouly organize them into piles–even in other people’s rooms! I remember I was over a friend’s house back in High School and literally had a headache when I entered her jungle of a room. She had hundreds of books, magazines and other junk on the floor, and by the end of the day I had convinced her into letting me clean up a bit. Call me crazy, but I actually enjoy spending hours cleaning and organizing clutter. Since I moved to Singapore, my makeup, jewelries and accessories have been stored in a messy pile. My makeup were all stuffed in small bags, while my jewelries were all tangled up together in small drawers. Sometimes I would lie awake at night, haunted by just the thought of sleeping meters away from all the clutter! I love them! 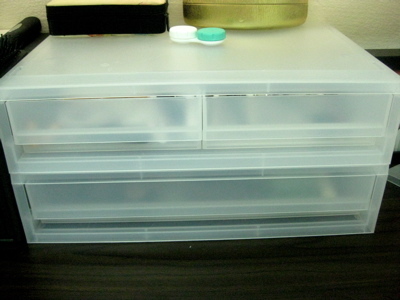 I love how they’re frosted and not completely see through like most plastic drawers that I’ve seen around. They’re also stackable, so I can easily buy extras when I need them. I shared makeup with my mom and sister back in Manila, so I could only take a few of them with me to Singapore. I am starting to build my own collection now (I’ve been crazy over makeup these past few weeks), and the small stash that I currently have fit just right in the three-drawer (two small and one big) setup that I got. 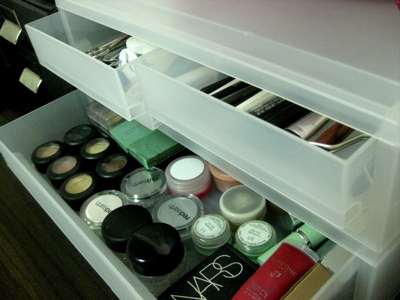 I’m thinking of getting another two-drawer set so I can organize the makeup better by separating them according to their use and purpose. 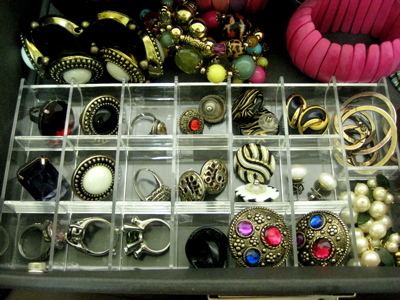 For my jewelries and accessories, I got these plastic dividers to organize my rings and a couple of my earrings. The size is just perfect, as they’re big enough to store my bigger rings (I love over sized rings!). I love how organized it looks and how I can see every one of them. It will definitely be easier for me to pick them out. Although, I was disappointed when I realized that these didn’t come glued together. I had to spend several minutes taping them together, so they wouldn’t fall apart. I’ll check back in the store whether they have some that are ready to use. What about you guys? How do you store your mekeup and accessories?